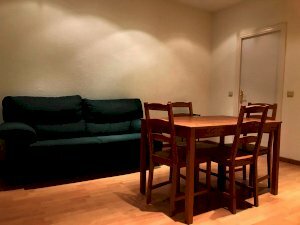 helpMadrid | Apartement Trujillos 3 in Madrid Sol - Shared Flat with 1 rooms. Are you looking for a beautiful apartment in the center of Madrid? If so, then this is the place for you. 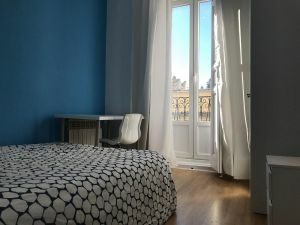 This wonderful 2 bedroom, 1 full bathroom and 1 half bathroom apartment is located right in the heart of the city, only a few minutes away from some of Madrid's best sights like the Royal Palace, Plaza Mayor, Puerta del Sol, and Gran Via. 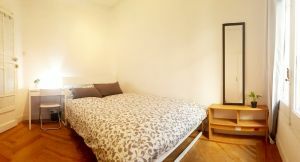 The first bedroom has a 90 cm bed, a big closet, air conditioning and a balcony. The living room area has a sofa, table with chairs, TV, air conditioning and a cozy balcony. The kitchen is fully equipped with dishwasher, oven, washing machine and all the kitchen utensils. The second bedroom has a private bathroom, a big bed, desk, chair, air conditioning and huge closets for all your belongings. You will love this place!